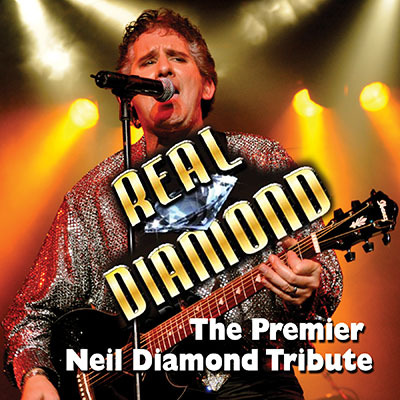 REAL DIAMOND | Love Productions Inc.
Curt Di Domizio fronts the band with a chillingly realistic Neil Diamond interpretation. Audiences are amazed and dazzled as they dance and sing along to four decades of incredible, unforgettable songs. The set list includes note-for-note renditions of all Neil Diamond’s greatest hits including: Cherry Cherry, Holly Holy, Kentucky Woman, Cracklin Rosie, Sweet Caroline, America, Love on the Rocks, September Morn, Solitary Man, I’m a Believer, Song Sung Blue, Heartlight, You Don’t Bring me Flowers, If You Know What I Mean, Thank the Lord for the Nighttime, I am… I Said, Hello Again, Brother Loves Traveling Salvation Show, Play Me, Desiree, Shilo, He ain’t Heavy, Red Red Wine, Forever in Blue Jeans, Beautiful Noise and many more.